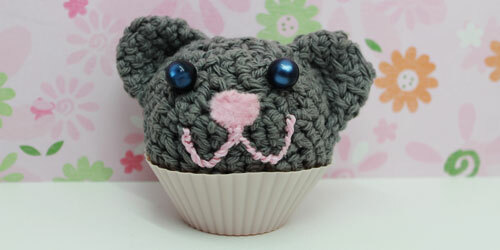 This entry is part 10 of 13 in the series 30 Crafty Projects to Complete Before I’m 30. 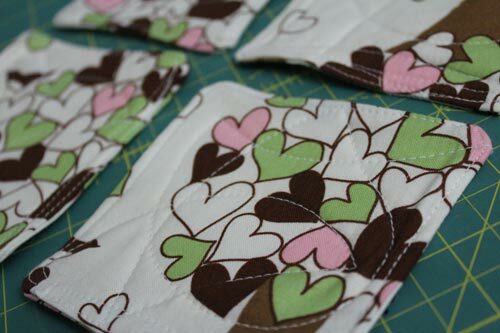 This project was inspired by Ashley (of Joyfully Jenson)’s cut canvas project. 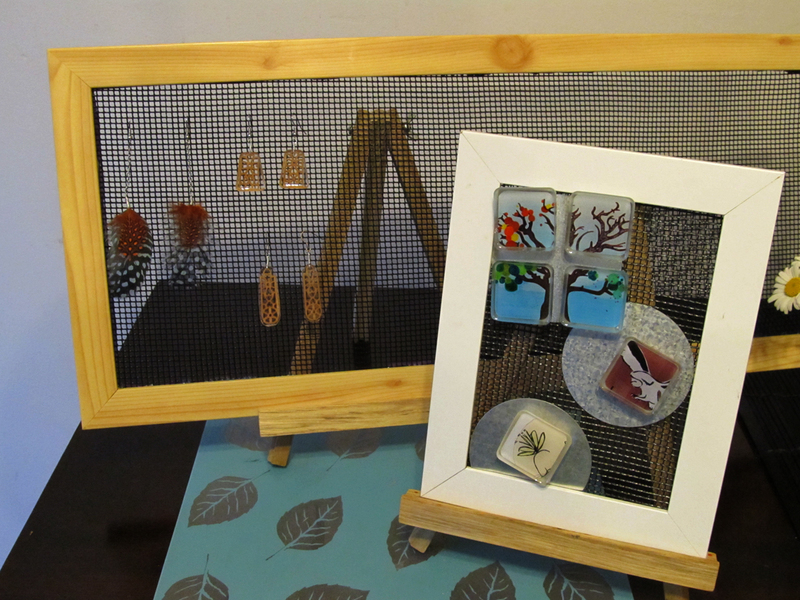 When I saw her project, I decided to add it to my 30 Crafty Projects to Complete Before I’m 30 list, with a small twist: a silhouette instead of an all-over pattern. 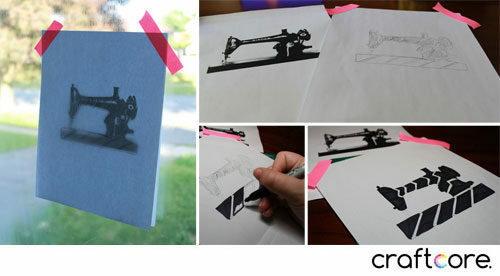 I decided to do a silhouette of a vintage sewing machine. I looked online for some silhouettes, but I didn’t find anything that I liked (too complex, too simple, not a model that I liked, etc). 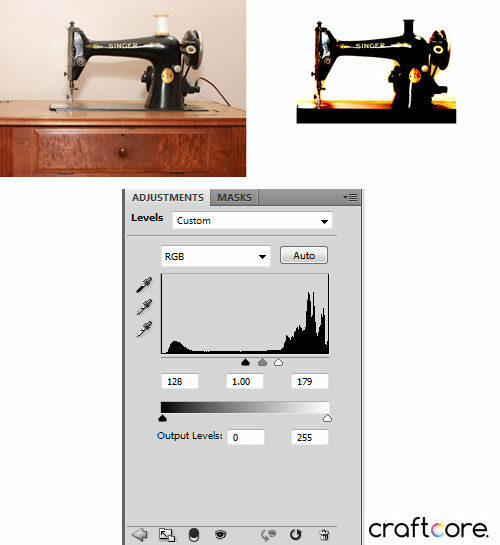 I decided to use a photograph of my Singer 66 sewing machine and turn it into a silhouette myself. Want to make a cut out canvas like mine? 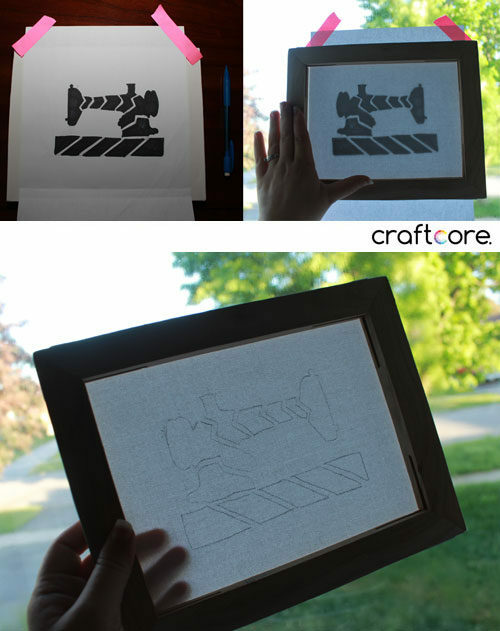 Here are the step by step instructions, including how to make the stylized silhouette. This post contains affiliate links, which means that if you click on one of the product links, I’ll receive a little commission at no extra cost to you. Choose a reference photo that you’d like to make into a silhouette. 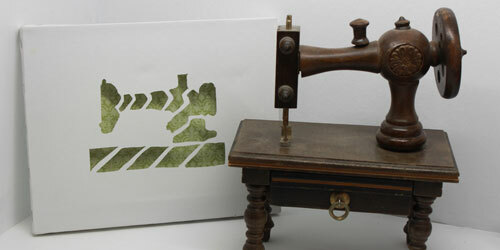 Photos that work best have a lot of contrast to begin with, such as this dark sewing machine against a beige background. If it’s too low contrast, it may be difficult to trace. Open up the photograph in Adobe Photoshop or similar graphic editing program. Create a new adjustment layer. Depending on the version you are using, it may be in a different location. Try the Layer menu > New Adjustment Layer > Levels. You can adjust the levels using the black, grey, and white triangles to adjust the white, black and grey threshold of the image. Play around with the settings until you get something that you’d like. On my photograph, I simply erased the desk completely so that it wouldn’t be part of my silhouette. Note: This does not need to be perfect. We’ll be tracing our silhouette on paper later, so don’t spend a lot of time on this. Don’t have Photoshop? 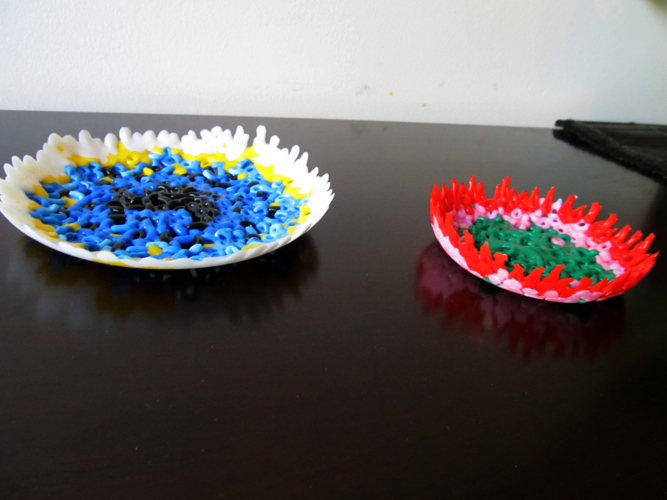 It is not necessary to increase the contrast this way, but it does make it easier to trace later. Feel free to skip this step. Print out the photograph on standard copy paper in black and white. No need to print it out using fancy photo paper as we’ll just be using it for reference.If you don’t want to make your own silhouette, you can find a variety of royalty-free silhouettes online. Take your print out and tape it to a window that faces the sun. 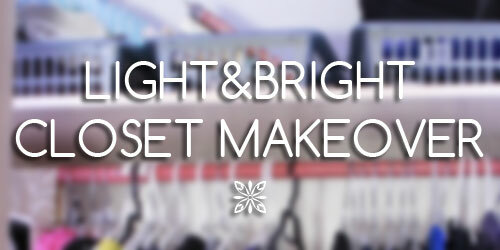 You’ll need it to be daylight outside to use the sun as a natural light box. Take a second piece of copy paper (blank), and tape it in place on top. Using pencil, trace around the outside of the silhouette. You don’t want to capture every detail, just the essence of the shape. For example, even though my high contrast image included the “Singer” logo, I did not include this on the design. At this point, you could call your silhouette done, but it’s more visually interesting if you can break up the silhouette into chunks. I decided to make zig zag lines to break up the silhouette into smaller pieces. Colour in all the areas that you want to be cut out with a black marker. Take your stylized silhouette image and tape it in place to the front of the canvas. Flip the canvas over and hold it up against the window again. Trace the black areas with a pencil on the back of the canvas. 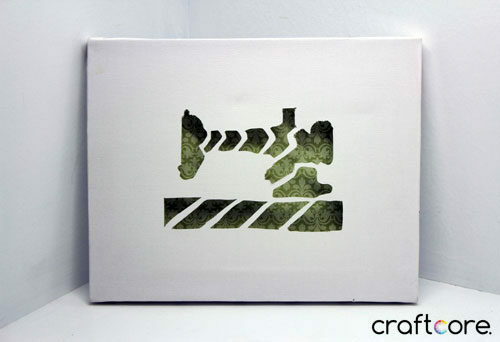 Take your canvas to your cutting mat and start using the X-Acto knife to cut out the design. If you happen to have one of those Fiskars Shape Cutters (Fiskars Ultra ShapeXpress), they work extremely well! Unfortunately with the shape cutter, you can’t get too close to the edge of the canvas, so you’ll need to combine it with the X-Acto knife. Despite this, the Fiskars tool really saves time. 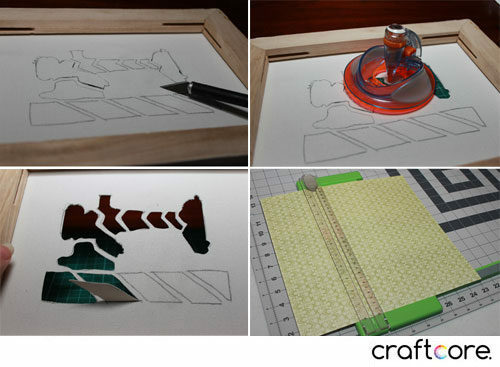 Using a paper cutter or a pair of scissors, cut out a rectangle just a bit smaller than the size of your canvas. My canvas was 8″x10″, so I cut my paper at 7.75″ x 9.75″. Glue or tape the paper in place on the wood frame. You could leave the paper off and simply show the colour of your wall from behind your silhouette, but I like the opportunity for a pop of colour. Since the background is affixed to the frame, there is room for a shadow, adding additional depth to the artwork. If you are attaching this to the wall rather than leaning it on a shelf, you may need to cut a hole in the paper to expose the hanging hardware of your choice. As an additional option, you could also paint the canvas rather than leaving it the default white colour. Since my craft room has white furniture, I wanted to keep the artwork in line with my colour scheme.